Is there a new breed of coach in college athletics? 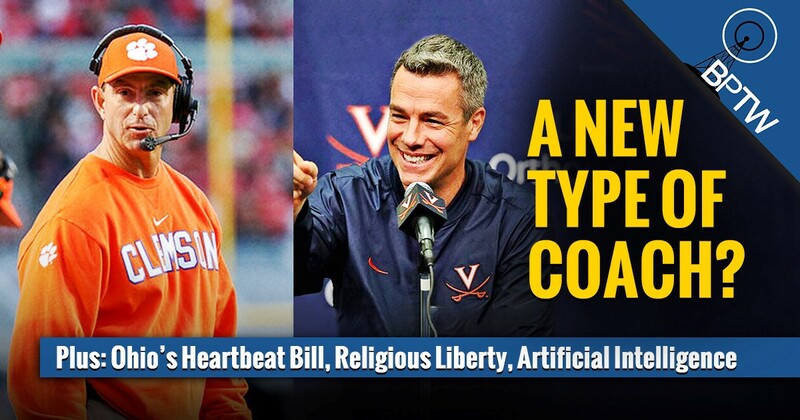 Two big-sport championship coaches–Tony Bennett of Virginia basketball and Dabo Sweeney of Clemson Football–display decidedly biblical principles in the way they treat their players. John Stonestreet and Warren Smith also discuss the passage of Ohio’s “hearbeat” bill, which would ban abortions after a baby’s heartbeat is detected–and how the media is trying to cast it as a radical, unreasonable law. They wrap up the show discussing religious liberty for all means “for all” (including Muslims and Buddhists) and the Ethics and Religious Liberty Commission’s statement on AI. As we enter Holy Week, be sure to check out our series of meditations: “The Seven Last Sayings of Jesus from the Cross.” It’s available as a free .pdf download.